CECHBxx - Model B - console in Japan, North America and Taiwan. The CECHBxx 20gb PS3 is better known as the backwards-compatible 20gb Playstation 3 launch console in Japan and North America. This model is, for the most part, the "second" Playstation 3, released day one with CECHA "60gb" in Japan and North America. The CECHB "20gb" and the CECHA were the only PS3 consoles with full PS2 compatibility. The CECHB "20gb" console was marketed as a lower-priced economy alternative to the 'premium' CECHA 60gb PS3. The CECHB 20GB notably lacks the memory card inputs, quadruple USB ports, and built-in Wi-Fi of its sibling. This model was discontinued shortly after launch due to lack of demand compared to the CECHA "60gb" console. POWER CONSUMPTION - 200 Watts Avg. / 380 Max. USB - The front of the CECHB console has two USB 2.0 compatible ports. The ONLY model of PS3 with NO built-in Wi-Fi connectivity. 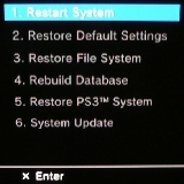 Return to PS3 Specifications from 20gb PS3.